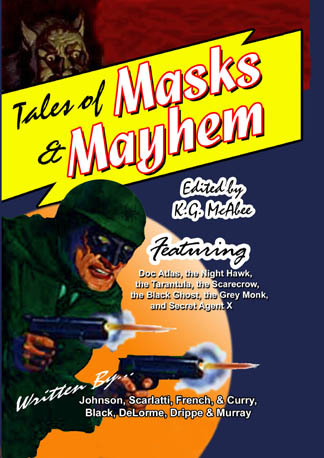 For lovers of exciting thrills and adventures in the pulp tradition, don’t let these anthologies elude you. All are available on Amazon in print. V #2 & 3 are available in eBook from Ebooktime.com, and #3 is available as an eBook at NTD, Kindle, and elsewhere. Great reading, written some some of the best new writers in the pulp field. 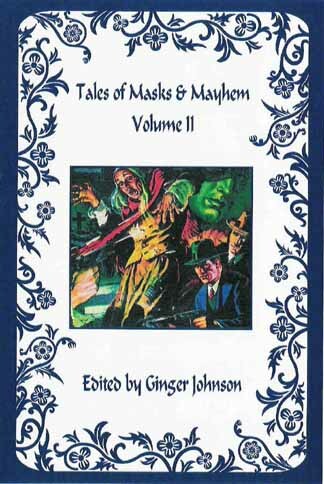 V #4: This large volume contains "The Hooded Hunter" by Max Scarlatti, "Prophet of Peril" (a Masked Avenger story) by Lamont Wentworth, a new Crimson Mask story, "The Crimson Mask's Justice" by Frank Johnson, Doc Atlas returns in "His Master's Voice" by Michael A. Black and Ray Lovato, and Tom Johnson's Black Cat story, "Partners In Crime" rounds out the issue. 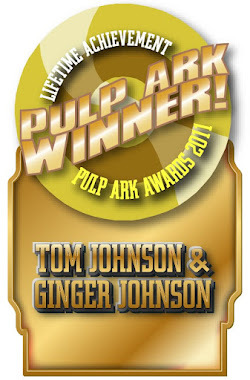 With a great cover by Matt Lovato, this is a must for all pulp fans. V #3: THE CULT OF THE FACELESS FIEND by Thomas V. Powers featuring Crimson Bat. THE FACE OF CHU-JUNG by Eric Turowski. SIDEWINDER by Debra Delorme featuring Scarecrow. DEATH AND THE BLACK GHOST by Tom Johnson featuring The Black Ghost. 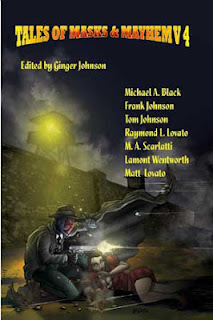 A TASTE FOR MURDER by J. Michael Major featuring Black Bat. SOULS ON FIRE by John L. French featuring Grey Monk. THE DUST OF DEATH by Joel Jenkins featuring Eel & Adder. SATAN PLAGUE by Michael A. Black featuring Doc Atlas. THE VACATION by Ginger Johnson featuring Mr. Minus. 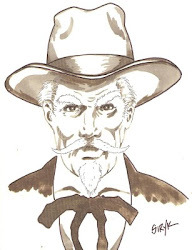 CATCH A FALLING STAR by Dale J. Roberts featuring Mr. Mystery. V #2: FIRST FLIGHT by K.G. McAbee & Tom Johnson featuring Shadowhawke. WOLF'S CLOTHING by John L. French featuring Grey Monk. ARCTIC TERROR by Michael A. Black featuring Doc Atlas. MIDNIGHT MOON by Terry Nudds featuring Moon Man. FOR THE LIFE OF A CHILD by Debra Delorme featuring Scarecrow. THE BEGINNING by Ginger Johnson featuring Mr. Minus. THE LADY OF DEATH by G. Wayman Jones featuring Black Bat. THE CHINESE CONNECTION by Alanna Morgan. V #1: MONARCH OF THE FLAME-MADNESS by Maxentius Andor Scarlatti featuring The Tarantula. CRIMSON HARVEST by Therese Drippe & Tom Johnson featuring The Black Bat. 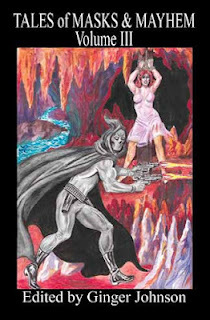 THE GREY MONK’S JUSTICE by John L French featuring The Grey Monk. THE LUNAR LEAGUE by Lance Curry featuring The Moon Man and Secret Agent X. GORILLA KILLER by Michael A. Black featuring Doc Atlas. HUNTER’S MOON by Debra DeLorme & Tom Johnson featuring The Black Ghost and The Scarecrow. THE NIGHT HAWK by Will Murray featuring The Night Hawk.